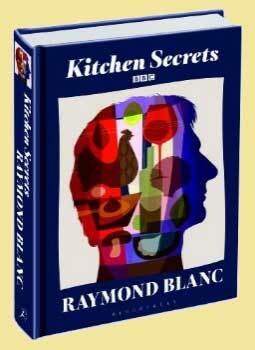 Kitchen Secrets is the long awaited new book from culinary legend Raymond Blanc, showcasing the recipes from both the first and the upcoming series of the acclaimed BBC 2 series Kitchen Secrets. Years of experience and a lifelong love of food have given Raymond a rich store of knowledge and the skill to create fantastic dishes that work time after time. Here, Raymond Blanc lets-us in to the many kitchen secrets that he has learned-over the years. After all, he reminds us, the joy of a secret is in sharing it. With a range of achievable and inspirational recipes for cooks of all abilities, Kitchen Secrets is all about bringing Gallic passion and precision into the home kitchen. Raymond has done all the hard work, refining recipes over months and even years until they are quite perfect. Every recipe includes explanations and hints to ensure that your results are consistently brilliant. Dishes that once seemed plain, or impossibly complex, suddenly become simple and elegant; the book's sixteen chapters include classics like watercress soup, brioche, chicory and Roquefort salad, cep ravioli, apricot cassoulet, chicken liver parfait, confit salmon, moules mariniere, grilled Dover sole, pot au feu, lamb's liver persillade, roast wild duck, slow roasted shoulder of lamb, galette des Rois, cherry clafoutis and Maman Blanc's own chocolate mousse. 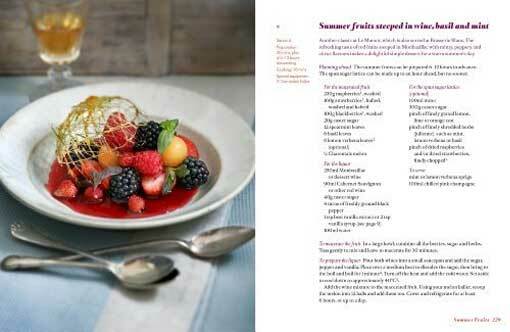 Kitchen Secrets is guaranteed to be a must-have for anybody with a love of French cuisine and finesse. Totally self-taught, Raymond Blanc is one of Britain's best-respected chefs. His hotel-restaurant Le Manoir aux Quat' Saisons in Oxford has been awarded two Michelin stars for the past 26 years and in 2007 he was awarded an OBE for services to culinary excellence. With beautiful photography by Jean Cazals and illustrations by Paul Wearing, the well designed pages make the recipes, with their detailed explanations and notes, easy to follow making this a must have book. We have fished our cod to near extinction and whilst stocks are hopefully replenishing, it is lovely to have a fish like pollock. Although not as sumptuous as cod, it has a great texture and big flavour and is underrated, in my view. After all, it is a member of the cod family. Cooked in homes all over France, this recipe is part of the classic French repertoire. 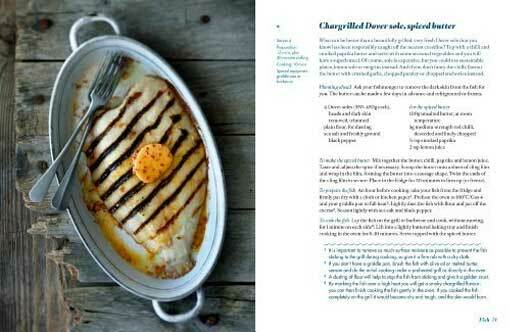 The method of pan-frying lends itself to other round fish, including salmon, cod, hake and mullet. Planning ahead The croûtons can be prepared well in advance and reheated in the oven. To cook the potatoes for the pomme purée Peel and quarter the potatoes, cutting them into even-sized pieces. Place in a large saucepan, add enough cold water to cover and bring to the boil over a high heat. Reduce the heat so that the water is gently simmering and cook for 25  30 minutes3 until the potatoes are soft. To finish the purée Tip the cooked potatoes into a colander to drain and leave for 2  3 minutes to allow excess steam to escape. Pass the potato through a mouli or fine potato masher and return to the saucepan. Using a wooden spoon, gradually mix in 170ml warm milk and then stir in the melted butter and seasoning. Taste and correct the seasoning if necessary. If the purée is too firm, thin it down with a little more milk. You know you have the perfect purée when it is fluffy, forms firm peaks and melts in your mouth. Keep warm over a pan of simmering water. To cook the fish Preheat the oven to 200°C/Gas 6. Pat the pollock fillets dry and season the flesh side with salt and pepper. In a large ovenproof frying pan over a medium heat, melt the butter and heat until foaming, then add the fish fillets flesh side down and colour for 5  6 minutes4. With the aid of a fish slice, carefully turn the fillets onto the skin side and cook for a further 1 minute. Now place the pan in the hot oven for 4  5 minutes. Take out the pan and place back on a high heat for 1 minute. 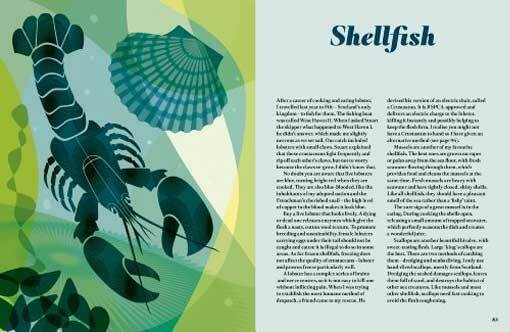 Carefully transfer the fish fillets from the frying pan to a warm serving dish. To make the sauce Add the water to the hot pan and stir so that the caramelised juices dissolve and emulsify into the liquid as it boils5. Add the lemon segments and juice to the frying pan with the capers, shallot and parsley. Bring back to the boil, taste and correct the seasoning if necessary. 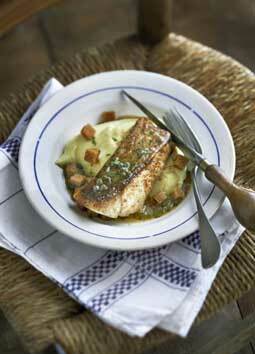 To serve Spoon the pomme purée onto warmed plates and place the fish on top. Pour the sauce on and around the fish6, scatter over the hot croûtons and serve. Variations You can replace the water with brown chicken stock to give more depth of flavour to the sauce. Flavour the potato purée with crushed garlic, freshly grated nutmeg, olive oil, freshly grated horseradish, mustard or any chopped herbs you like. to a different variety every few months. To make the croûtons, cut crustless white bread into 1cm cubes, toss in melted unsalted butter or olive oil and scatter on a baking tray. Toast in a preheated oven at 200°C / Gas 6 for 5  6 minutes. Do not boil the potatoes rapidly or they may overcook and absorb excessive water, making a watery purée. The success of this dish lies in the understanding of the simple technique of pan-frying and regulating the temperature to achieve the right degree of heat. The butter will start to foam at about 130°C. At about 150°  155°C it will go hazelnut colour. This is the perfect stage to caramelise the fish without drying it. If the butter becomes too hot, it will burn and the fish will dry out. However, if the butter isnt hot enough, the fish wont brown and it will stew in its own juices. At this stage, if the temperature is right, the smells are invading your kitchen. And while the fish proteins are browning, the juices are seeping out and collecting at the bottom of the pan  begging for a splash of water to create a heavenly jus. Simply adding water to the pan the fish has been cooked in can create a most exciting jus, as it dilutes the caramelised juices at the bottom of the pan. Often people discard the skin, but to me this is the best part, and the most nutritious as it is where the essential omega fatty acids are concentrated. This is one of the most popular desserts in Brasserie Blanc. Simple, delicious and easily achievable at home, it is a wonderful chocolate experience. You can omit the base, if you like (see variations overleaf), though that would be a shame. Planning ahead The delice needs to be made around 8 hours in advance to allow time for it to set. To make the base In a large bowl, mix the cornflakes and hazelnut praline paste together thoroughly with a wooden spoon, to make a smooth paste that can be easily pressed into the corners of the mould. Sit the rectangular frame or tart ring on a tray lined with non-stick baking paper. Tip the praline and cornflake paste into the mould and spread evenly with the back of the spoon to an even 4mm thickness. Refrigerate for 30 minutes until firm. To make the chocolate delice Lightly whisk the eggs together in a bowl. In a medium saucepan, bring the cream and milk just to the boilz2. Slowly pour onto the eggs, whisking as you do so. Add the chocolate and stir until melted and smooth. Pour on top of the cornflake base. Leave to set in the fridge overnight. To prepare the caramel hazelnuts Preheat the oven to 170°C / Gas 3. Scatter the hazelnuts on a baking tray and toast them in the oven for 8  10 minutes3. While the nuts are still warm, carefully push the sharp end of a cocktail stick into each one. Affix some Blue-tac pieces under a shelf near to the cooker and place a tray underneath to collect any excess caramel4. In a small heavy-based saucepan over a medium heat, melt the sugar and then cook to a dark golden caramel5. Immediately dip the base of the pan in cold water for 2 seconds to stop the cooking process6. Leave to cool slightly for about a minute, until thickened to a coating consistency7. Now, holding the cocktail stick, dip each hazelnut into the caramel to coat. Press the other end of the stick into the Blue-tac, to suspend the caramel-coated hazelnut vertically. After a minute the caramel will have set hard with a beautiful long tail. Place on a tray lined with greaseproof paper. Repeat with the rest8. To make the coffee foam Soak the gelatine leaves in a shallow dish of cold water to soften for a few minutes. In a small pan, heat the coffee and stir in the sugar to dissolve. Drain the gelatine leaves and squeeze out excess water, then add to the hot coffee and stir until melted. Now whisk in a large bowl or pour into a large jug and foam using a hand blender9. To serve Using a sharp knife dipped in hot water, slice the delice and sprinkle with grated chocolate, if using. Arrange on serving plates with the coffee foam alongside. Garnish with the caramel nuts. Variations To simplify the dish, omit the cornflake and praline base. Pour the hot chocolate cream into a serving dish and leave to set; serve with vanilla ice cream. Or to make chocolate ganache, set the chocolate cream in a tray, cut into cubes and dust with cocoa powder. 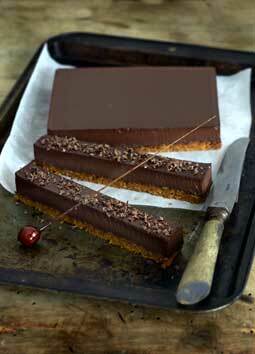 To make a divine chocolate tart, pour the filling into a pre-cooked pastry case. You can buy praline paste from good confectioners or make your own: in a pan, melt 200g sugar and cook to the hard-crack caramel stage. Add 200g skinned hazelnuts, stir and pour onto a tray lined with non-stick baking paper. Cool until set, then blitz to a paste in a blender, adding a little warm water if needed. It is important that the cream and milk mixture is boiling hot when you add it to the beaten eggs, as this will partially cook them and help to set the mixture. Toasting the hazelnuts releases their natural oils, giving a more intense flavour. Sometimes as a cook you have to improvise. Using Blue-tac to suspend the hazelnuts on cocktail sticks allows them to form decorative caramel tails. Dont take the caramel off the heat too early. You need a pronounced caramel flavour; a pale caramel will be overly sweet and uninteresting. Be careful at this point, as the intense heat of the pan will make the water it is dipped into boil instantly. This step is necessary to stop the caramel cooking and keep it at the right colour. You need to catch the caramel at just the right stage; too hot and it will be too thin; too cool and it will begin to set. Bonne chance! Due to the humidity in a kitchen, it is best to prepare the caramel hazelnuts within a few hours of serving, to ensure they dont become limp and sticky. This magic foam will not last forever, so do this at the last moment, just before you serve. If you make it too far in advance it will collapse, but dont worry, to rescue it simply whisk again. This is a great classic of French cuisine and it originates from my own region. It is quick and easy to prepare and I urge you to cook it for your friends. To me, morels are the finest mushrooms in the world and you can now find them dried in good supermarkets. I even prefer the dried ones to the fresh ones as their flavour is so much more pronounced. The traditional Jura wine is the best, if you happen to have some, otherwise a dry sherry works very well. Planning ahead The dried morels need to be soaked for at least a couple of hours. You can prepare the chicken half an hour in advance and warm it through in the morel sauce to serve. To prepare the morels Drain the morels, reserving the soaking liquor, and squeeze to extract as much of the liquor as possible. Rinse the morels, drain and squeeze dry. Cut larger morels into smaller pieces; set aside. Pass the reserved liquor through a muslin-lined sieve to remove any sand or grit and save 100ml. To cook the chicken Season the breasts with salt and pepper. In a large frying pan, melt the butter over a medium heat until it is foaming2. Add the chicken breasts and colour lightly for 3 minutes on each side. Remove from the pan and reserve. In the fat remaining in the frying pan, soften the soaked morels and button mushrooms together, for 1  2 minutes. Meanwhile, boil the sherry or wine in a small pan for 30 seconds. Add the sherry or wine3 to the mushrooms with the reserved morel liquor and a pinch of salt. Pour in the cream and bring to the boil. Place the chicken breasts back in the pan, making sure the cream sauce covers them. Lower the heat to a gentle simmer and cook for 10 minutes, depending on the size of the chicken breasts, until they are just cooked through4. To cook the leeks While the chicken is cooking, put the leeks into a saucepan, pour on the boiling water and add the salt and butter. Cover and cook at a full boil for 5  10 minutes until tender. To finish the dish Using a slotted spoon, lift out the chicken breasts and place in a warm dish; keep warm. Boil the sauce rapidly to reduce until it is thick enough to coat the back of a spoon. Taste and adjust the seasoning. Place the chicken breasts back in the sauce to reheat for 2 minutes. To serve With a slotted spoon, lift the leeks from their liquor and arrange on warmed plates. 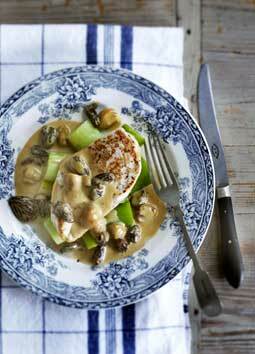 Sit the chicken breasts on top and pour the morel sauce over and around. By this time your kitchen will be filled with heavenly smells. Accompany with a chilled bottle of Jura wine for a perfect moment. Bon appétit. Variations Use dried ceps in place of the morels. Or you can use fresh wild mushrooms, adding them with the button mushrooms. Replace the chicken with guinea fowl or pork chops, adjusting the cooking time accordingly. Dried morels are highly prized by the gourmet. These mushrooms grow in many parts of Europe during the spring. Conical-shaped, with a distinctive honeycomb structure, they hold sand and grit, so need to be washed a few times in fresh water to ensure they are thoroughly cleaned. The butter will start to foam at about 130°C. At 150°  155°C it will turn a hazelnut colour. This is the perfect stage to caramelise the chicken without drying it. I boil the sherry or wine before adding it to the dish to remove most of the alcohol, retaining the flavour and character. It is essential to avoid overcooking the chicken, or it will become dry. The timing here should ensure that your chicken is tender and succulent. This is a new format of book review from Hub-UK. The idea is not to sing the praises of the book but to give you the chance to judge for yourself what the book is like by allowing you to glimpse some of the content. Obviously we think the book is worth considering otherwise we would not have published this page but the question remains . . . is it your sort of book? a means for sites to earn advertising fees by advertising and linking to [insert applicable site name Amazon.co.uk / Amazon.com.